For today, it’s questions from Alzarius and Jasper Merendino about how to deal with Equipment – and games running with limited or no magical items – in Eclipse. It’s self-evident by now that I’m a big fan of Eclipse. It gives you (near-)total freedom to design the character you want, both in terms of class and race. But it doesn’t address the “third pillar” of character design, which relates to character gear. Now, this is to be somewhat expected. It’s a book about character-design, after all; neither it, nor The Practical Enchanter (which is about spells and magic items) are supposed to necessarily deal with wealth-by-level issues. Having said that, the issues are still there (and perhaps more prevalent for being the only major “by-level” issues remaining with class and race made into a point-buy system). Unfortunately, the system works in a way that, if you deviate from these prescribed values too much, the game starts to suffer as you go up in levels – PCs who fall below these values find themselves lacking in the necessary magic items (e.g. the “Big Six“) to increase their statistics to the point where they find themselves fighting monsters of the “appropriate” Challenge Rating with undue difficulty; the reverse is also true, where PCs with too much wealth will purchase better magic items and more easily undo their enemies. Now, Eclipse does lap on the fringes of this problem. With powers like Innate Enchantment and Siddhisyoga, you can deal with some of the outlying problems of magical gear, such as its loss or destruction – but it doesn’t deal with the underlying problem of the inherent assumption of a certain amount of magical gear being available at each level. How would you deal with this problem in the context of Eclipse/TPE (assuming that you can at all)? The best I can come up with is to try translating the wealth-by-level charts into a certain amount of “bonus” CP gained at each level in lieu of the gear. This has many problems, however, even beyond trying to figure out what the appropriate CPs would be – such as if a PC receives those bonuses and then finds a way to gain some magic treasures in-game (meaning that at least part of those CPs would need to be revoked…which is a whole ‘nother kind of headache). One could, I suppose, try and ignore the issue of wealth-by-level altogether, simply handing out rewards and magic items randomly (for, say, random encounters) or as the story dictates (“we finally broke into the Vaults of Dagon!”) and let the chips fall where they may, but that carries the risk of falling back into the “yes, that encounter was CR-appropriate, you all just didn’t have the magic arms and armor necessary to make it a fair fight” problem. What’s the answer here, if I wanted to be free from the shackles of wealth-by-level in my Eclipse game, without throwing power-levels off? A-MEN, brother! I, too have felt the profound cognitive dissonance of a(n otherwise excellent) system that allows me to build magic item equivalents into my body, but won’t address buying them with some enhancement of starting wealth. In the dimension-hopping Federation-Apocalypse Setting, Wealth is a skill, and you simply make skill checks to buy things. Since the number of personal special items (whether magical or technological) that you can keep functioning as you cross the dimensions is strictly limited – and depends on your Gadgetry skill, not on your funding – wealth there is more of a convenience than a measure of power. In d20 Modern, wealth is a floating bonus that goes up and down – but there’s no detailed tracking of wealth; if something’s cost is below your current wealth bonus… it basically has no cost as far as you’re concerned. In the Twilight Isles, you spend some character points (or get some back) buying a wealth level from the Practical Enchanter, albeit with a few tweaks. In Chelm, on Atheria, wealth is a share in the services provided by the bound spirits of people who have been sacrificed for that purpose – and normal magic items do not exist. In this Dark Ages setting you can buy a medium-sized castle for a hundred gold pieces. Magic items exist – but the (standard) cost of making them means that they are vanishingly rare; most of them are the creations of gods or other major supernatural powers and are effectively priceless. If you find one… it’s an amazing treasure, pretty much regardless of what it is. In a post-industrial transhuman setting wealth is measured in favors owed – which don’t really translate into any kind of “price scale”. If you need something on a personal scale, it’s free. If you need a Mecha, or a spaceship, or something else major… you just call in a favor from someone who can provide one. In a modern Espionage Setting your resources really don’t matter; what matters is what you’re assigned for the mission. A high status in your organization – and maybe a good friend in the experimental equipment department – is what you want. And that’s the problem; I can easily create wealth systems for particular settings – but I really can’t create one that will function properly in ANY setting, which is what Eclipse is all about. There are a few spots in the book where there wasn’t much choice but to go with 3.5 assumptions – Siddhisyoga and Equipage primarily – but I tried to hold those down and made sure that Innate Enchantment dealt entirely in abstract fantasy gold pieces, rather than trying to translate setting costs. 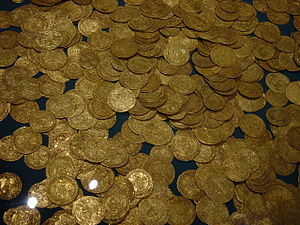 Similarly, the Witchcraft ability Tenebrium’s Coin (Page 118) provides goods and services which COULD be resold, but will thus be automatically translated back into the games economic system, rather than directly into “gold pieces” which may not exist in the setting. Of course, even just sticking with generic 3.0 and 3.5 fantasy… any simple direct character point to gold piece system is going to be hopelessly wrong at some point. The importance of any given amount of gold pieces changes over a characters career. To approximate from the costs of feat-granting items lets say… 1000 GP per CP. For a first level party is it worth getting someone to invest a bonus feat in 6000 GP worth of gear? Of course it is! A couple of Wands of Cure Light Wounds alone will drastically upgrade the parties survivability and will still leave 4500 GP to invest in other useful stuff – and even if the marginally-weaker character who’s short a feat gets killed or replaced, the party will continue to benefit. Is that same choice worthwhile for a tenth level party? No, it’s not – and even for an individual character it’s pretty questionable. At level twenty? It’s pretty definitely a really bad deal no matter how you go about it. We could use a sliding scale too. At the simplest… use the standard Character Wealth By Level table and assign a definite bonus value to Privilege (Wealthy) and Major Privilege (Filthy Rich). Say… +10% at Wealthy and +20% at Filthy Rich. That’s simple, easy, and… headache inducing. Where is the extra money coming from? Do you get matching funds from somewhere on your share of the presumably evenly-split treasure? If your source can come up with 152,000 GP when you’re level twenty, why couldn’t it come up with 5000 back when you were level one and REALLY needed it? Even worse… this really isn’t worthwhile at level one. An extra 20% on your starting cash is pretty worthless in comparison in comparison with six extra character points to spend. Which will help survivability more? Grant of Aid with +4 Bonus Uses Specialized in Hit Points (6 CP), Luck with +4 Bonus Uses Specialized in Saving Throws (6 CP), or… an extra Potion of Cure Light Wounds to start out with? At level twenty? That’s oh-so-worth it. Another no-brainer there. If it’s being handled this way… buy that “wealth” ability later on, when it means something. That’s why Privilege (Wealth) doesn’t have specifics attached. Instead it simply gives you “a few servants and some extra starting cash at lower levels” (e.g. whatever the game master thinks is reasonable for the setting; as Alzrius mentions in a later note… a fine sword, some armor, and a warhorse is perfectly reasonable for a younger son from some noble house. Of course, if you’re playing in Melinibone… that same level of privilege might get you demon armor, magical weapons, and a dragon to ride). At high levels… no reasonable level of mundane family or investment wealth will mean anything in comparison to a high- or epic-level character’s wealth-by-level – but coming from an influential family, and having good social connections, is usually well worth three character points. By that time a character has plenty of those too. If you want to upgrade your Stipend change some of the Specializations and Corruptions on Harvest of Artifice and/or Transmutation to “Increased Effect”. For another +6 CP – call it “The Midas Touch” – you can get it up to 1200 GP/Month and about 12,000 GP worth of extra starting cash. Of course… if you have this sort of income, why are you adventuring? There are quite a few setting where this wouldn’t work properly, or where the game master might want to translate to the local value scale – but that’s not really that big a problem. If you’re playing in a setting where “money” doesn’t apply, you’d have to buy something else – perhaps Favors for that transhumanist setting, or Privilege for a tribal one where “wealth” simply means “my stuff is better decorated and I get some social benefits”. If you simply want to start with some magic items and the game master wants something more detailed than a Privilege to account for it, the question becomes “Where did you get it”? Are you a young princeling, who’s been pulling in favors and trading access to his father’s ear for goodies in the sure-and-certain knowledge that his older brother will banish him when he inherits? Buy Action Hero/Influence (Specialized/will become very VERY difficult to use, when the old king dies or if you’re away from court, 3 CP, 2 CP for also being Corrupted if the King is already dead when you start play ), Major Privilege (prince of the kingdom with many social advantages, can trade influence for goodies, Specialized and or Corrupted in the same way as the Influence (3 or 2 CP). Now take those Action Points and start bargaining with the GM for those goodies. Is the keeper of the Imperial Arsenal, or the research department, or your family, prepared to lend – or even outright give – you some gear? That’s Major Favors (6 CP). You’ll just have to be prepared to return it, or replace it if something’s happened to it in your custody, or do them some pretty major favors, when they ask for something in return. Have you got the abilities you need to make some stuff but lack the resources to actually do it? Action Hero/Crafting (Specialized for Increased Effect (can substitute for both XP AND Gold costs)/the user must discuss his or her action point expenditures with the game master in advance and must have access to appropriate workplaces) will let you start off with a small stockpile of whatever-it-is you can make. Have you stumbled across some fabulous and unique item? You can either spend a few points on a Relic or – if it’s some sort of Artifact – talk to your GM. Given that each of those is unique, and that more than a few are so much trouble that being stuck with one probably counts as a disadvantage rather than something you’d have to pay for, about the only possible rule there is to ask for a price. I can’t tell how much unknown plot devices are worth. Do you want some minor trinkets when the game master is not using Charms and Talismans? The “Able to use Charms and Talismans” package under Literary Magic Items has got you covered. A “Bonded Item”, or similar unique device can be fairly readily created as a Companion. Creating an “Item Familiar” is pretty easy (Specialized/Companion has a consciousness, but an inanimate form), it can share it’s Innate Enchantments and many other powers with you, and it’s remarkably cheap to build up it’s abilities. Simply being a Noble – a Privilege – is sufficient to start with things like a warhorse and a fine sword and an expensive suit of armor, and a few servants. Most of the time it won’t include much in the way of magic items beyond – perhaps – a few potions of Cure Light Wounds. After all, Nobles may be rich in lands, titles, history, respect, and lots of other intangibles, but they’re very often rather short on funds – and while you can order the smith to make armor, and have the peasantry support him while he works, that usually won’t suffice for magic items. Still, you may be able to talk your game master into something by upgrading to Major Privilege – perhaps some Regalia of Might from The Practical Enchanter. REALLY important young nobles may want to look into something like the “princeling” package (above) instead. If you can provide yourself with a selection of minor items, or obtain them readily from some other sources, some variation on the Maker of Potions, Talismans, and Scrolls package may suit what you have in mind. If you can empower minor devices with your own energies, you might want Occult Skill / Dream-Binding or something similar. After all, Occult Skill is open-ended; if you can persuade your game master to accept your proposed skill, you’ve got it. Dream-Binding (Charisma, No Unskilled Use, Restricted) allows the user to draw objects from dreams into reality. To do so, the user must get a full nights rest and forfeit the natural healing and attribute recovery that would normally result, whereupon he or she will awaken with his or her allotment of items. The maximum value of any item depends on the number of skill levels allotted to it according to the formula for skill-enhancement items (Bonus x Bonus x 100 GP), although no more than one-third of the total available skill levels may be allotted to any one item. Dream-binding cannot create items with charges (although uses-per-day limitations are fine), or skill-boosting items. Consumable goods will vanish once the skill points are re-allotted, so the creation of food and water is ill-advised. Finally, of course, the game master must approve of the list of items to be created. Of course, all of these options are designed to be ongoing parts of the game – to scale with level or be freely upgradable and to be a part of a characters suite of abilities, rather than a part of his or her background. Eclipse… simply is not designed for building character backgrounds as such; that’s a job for working with the GM and – perhaps – using some system like Distinctions and Demerits. That’s why none of these options address things like “I found a big treasure chest” or “I inherited a pile of stuff”. Those are – by their nature – fixed quantities. That means that they fall prey to the same problems that converting character points directly to gold do. I, personally, would NOT recommend allowing this particular build-option – but if you really MUST have it, I suppose you can try to talk your game master into it. Action Hero/Crafting, Specialized and Corrupted/only for use with “Create Artifact”, does not actually allow creating items but only acquiring standard ones with the approval of the game master, does not improve with level after character creation. The Specialization is for Increased Effect (also covers incidental costs and tasks required for “Create Artifact”) (4 CP). As usual, the exact cost of any item is up to the game master. Create Artifact, Specialized and corrupted/only for use with points from Action Hero / Crafting, does not actually allow creating items but only acquiring standard ones with the approval of the game master, does not allow any further acquisition of items after character creation (2 CP). There. That scales with the level you’re creating the character at (although characters created at differing levels will get radically different amounts of treasure for the same CP cost) – but this particular power can represent simply having a bunch of stuff. It’s a horrible rules hack though. You’ll note that most of these – with the exception being the stuff that the game master is already allowing you to make – involve “talking with the game master” somewhere. That’s because each setting is different, and items that are entirely reasonable for one may be totally unreasonable or disallowed elsewhere. The legendary, all-conquering, Spear of Ra, or the One Ring, or the Holy Grail – are minor trinkets in the Federation-Apocalypse setting; they only work in a handful of rarely-visited worlds among the endless realities the characters travel between. In a more conventional single-continent campaign… they might well be virtually all-powerful. Now, as for the “Big Six”… the trick here is that Eclipse characters don’t really NEED any magic items to do their thing. The first of the six is a powerful weapon or two. Up to +5 to Attacks and Damage, and another +5 in special functions. Quite impressive, albeit at a cost of up to 200,000 GP – but easily replaceable. A Martial Art – which thou, as an Eclipse combatant, SHALT TAKE (probably on the cheap via Adept) – can cover most of those bonuses. Throw in Focused Imbuement (most likely Specialized or Corrupted) – or a few character points worth of Innate Enchantments, or Rune Magic (Battlefield Enhancements), or Augmented Bonus, or Channeling, or a variety of other disciplines, and you’ll be doing as well or better. Armor and Shield is a little harder. Your martial art may help, but you may prefer to use it for other things. At the simplest, you’ll want Defender, Specialized for Double Effect (Most likely either only while wearing armor or only while using a shield, 6 CP). That will pretty well replace this category – and can be further enhanced via a tiny variant on Imbuement or by any of the other methods that work with weapons. For that matter, you can go to Block, or Reflex Training, or any of a lot of other ways to avoid taking damage in the first place. A Cloak of Resistance is a handy thing! It adds to saves! But… wait a moment; just what saves do I care about here? Falling down? -2 for a round due to some transient condition? Not really, no. I care about death effects, and disintegration, and mind control, and the other stuff that can take me right out of the fight or kill me. Worse… simple saving-throw bonuses are not really an answer; sooner or later I’ll roll a one and automatically fail. If I really want saving-throw bonuses, Augmented Bonus or Innate Enchantment (and The Practical Enchanter) will let me stack up a pile of them on the cheap – but powers like Action Hero/Stunts, Luck Specialized in Saving Throws, and Witchcraft (which can bring in a pile of other goodies very cheaply indeed), or Reflex Training (the Extra Actions variant) will get me out of trouble whether I could normally make the save or not. Fortunately, most characters can afford to pull a few points out of saves to invest in other defenses – so there’s not necessarily much of an actual cost here. A Ring of Protection and an Amulet of Natural Armor are next – and both serve exactly the same purpose; more AC. Going with Imbuement on your armor and/or shield will achieve exactly the same thing – as will any of the other possibilities listed with armor and shields. Finally we’ve got… attribute boosters. There aren’t that many good substitutes for these things. Sure, you can use Berserker to attain massive short-term boosts, but high attributes are just generally nice. Augmented Bonus and Finesse will let you get more mileage out of the attributes you’ve got, and Innate Enchantment can provide some +2’s on the cheap, but that +6 booster is so SHINY… This is going to be expensive; boosting attributes like that will cost several levels worth of character points. While well-built Eclipse characters do tend to be a good deal more effective than normal ones – which is why I usually count them as about +2 to +3 ECL – adding the attribute boosters to everything else will swallow up all those points. In this particular case, for games you really want to run without conventional magic items… my recommended fix is on page 189 of Eclipse (second-to-last paragraph). It’s to award Bonus Feats and Self-Development boosts at every even level, rather than every third and fourth level respectively. That provides +24 CP by level twenty over the standard progression – and an extra five levels of Self-Development. That covers the attribute boosters and the “big six”. Magic items are still neat though. You just don’t want them coming in all power levels and by the dozen. Instead you want… a few minor trinkets and one or two unique, exotic, and useful-throughout-their-career items per character. To get that, I’d recommend the Literary Magic Items and Sample Relics articles – especially the world laws (giving every character the ability to use Charms and Talismans and four points worth of Relics) for that option. That will give them some minor toys to say that “we’ve living in a magical world!” and one or two really worthwhile items each – as well as neatly making up for the lack of the minor stuff. And this has really gotten quite lengthy for a reply – but I hope it helps! For comparison, both Editorial0 and Spellweaver81 have also responded to these questions from their own – pretty much entirely different – viewpoints, and their answers are also worth a read! Thanks for writing this; this is a truly excellent and expansive article! Oh, you’re quite welcome; I’m glad it helped!